Obese cats are more prone to health issues than others. Notice your kitty endlessly chowing down on the large bowl of food you keep full for him? This could indicate that your cat has a tendency to overeat, especially if you see that he is packing on the pounds. Prevent your furbaby from becoming obese by controlling his portions. Calculate your cat's daily calorie requirements. The average cat needs between 25 and 30 calories per pound of his weight. A 10-pound cat requires about 280 calories per day, according to the National Research Council of the National Academies. If your cat is obese, he'll need about 80 to 85 percent of a lean cat's daily calories to help him lose weight. For example, a 10-pound cat that is considered obese for his size would need around 240 calories per day, recommends the NRC. Consult with your veterinarian to determine if your cat is overweight before feeding him fewer calories per day. Divide your cat's daily recommended caloric portion into two or more smaller portions to feed your cat throughout the day. A cat whose daily calories should be around 280 would be fed 140 calories twice daily or 93 calories three times a day. Separate these feedings by several hours to keep your cat feeling full. If you're not home during the day to feed several meals, use an automatic, timed feeder that opens various compartments at preset times throughout the day. Fill each compartment with the desired portion of food and set the timer each day before leaving. Switch your cat to a high-fiber, low-calorie diet that will keep him feeling full for a longer period of time, discouraging him from wanting to overeat, recommends an article published in the July 2006 edition of "The Journal of Nutrition." 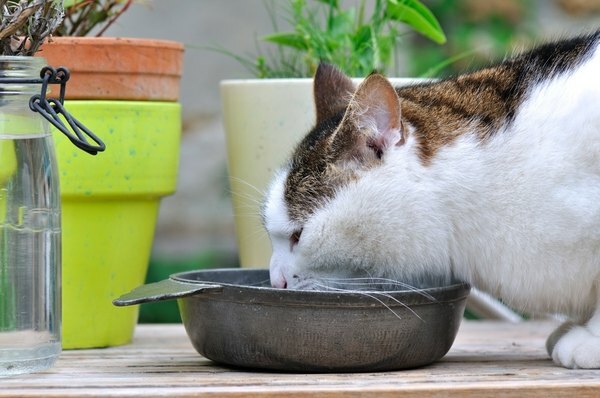 Always feed your cat food that meets the nutrient profiles established by the Association of American Feed Control Officials to ensure that he is getting the proper nutrition he needs, recommends the U.S. Food and Drug Administration. Without proper nutrition, your cat may be ingesting more calories because he's not getting the correct balance of proteins, fats, carbohydrates, vitamins and minerals his body requires. Monitor your cat while he eats to ensure that he doesn't eat the food of any other cats or dogs in your home. You may want to feed the animals in separate rooms to prevent your overeating kitty from sauntering over to his housemate and stealing a few nuggets of her food. In multiple pet households, you will have to feed the other animals in your home on a schedule, just like your tubby kitty. A hungry cat will snack on their food if it is left out to free-feed on, even dog food is fair game. This can cause problems, because dog food is not nutritionally balanced for cats. Place your cat's kibble in a treat ball or puzzle toy that your cat must move around to access the food inside. This keeps your cat busy during the day and makes him work for his food, making overeating more difficult. It also enriches his environment, reducing boredom and stress, which can sometimes contribute to compulsive behaviors like excessive eating, according to PetPlace. Cats are considered obese when they are 20 percent above their ideal weight, according to the Canadian Veterinary Medical Association. Such cats usually appear round in shape, and you will have difficulty feeling their ribs. As an alternative to a treat ball, you can hide small portions of your cat's food throughout your home so that he must hunt for it and won't overeat. Don't leave any pieces out for too long, and keep an eye out for ants or other pests it might attract. Provide your cat with plenty of toys and scratching posts to keep him busy throughout the day. A busy kitty won't have the time or desire to overeat. Bring your cat into the veterinarian for a health check if you observe him overeating. Certain health conditions like hyperthyroidism can increase your cat's appetite by increasing his metabolism. Various intestinal parasites or diabetes can also cause an increase in appetite. Never drastically reduce your cat's portions or change your cat's diet without the supervision of your veterinarian. Rapid weight loss in cats can cause hepatic lipidosis in cats, a potentially fatal liver disease, according to the Association for Pet Obesity Prevention. VetInfo: How to Stop a Cat From Overeating? Catster: How Much Should I Feed My Cat? Why Do Cats Drool While Purring? Do Cats Notice When You're Gone on a Trip?